BANDAI NAMCO Entertainment America Brings New Easter Update For Digimon Heroes! BANDAI NAMCO Entertainment America Inc. is bringing an all-new, Easter-themed update to their popular mobile card game for iOS and Android, Digimon Heroes! Starting on March 17, Digimon Heroes! gets an Easter makeover and will feature a new item, the Easter Ticket, which unlocks Easter Digi-eggs filled with better rewards than a chocolate rabbit. 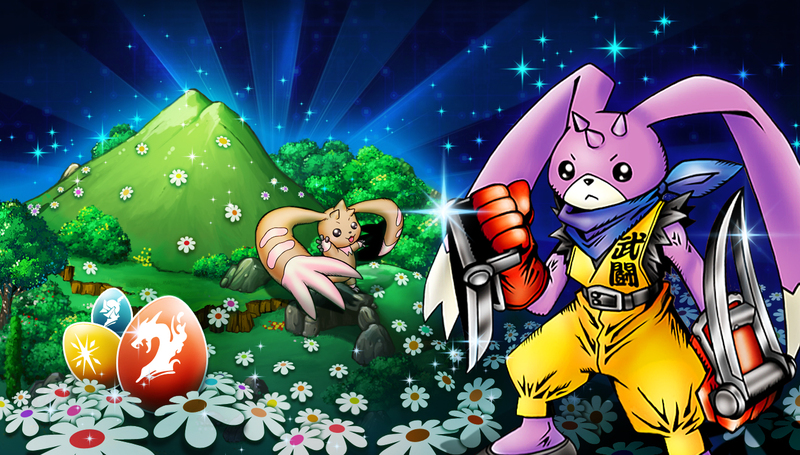 From March 17 – 31, players can gather these Easter Tickets to unlock great rewards inside Easter Digi-eggs such as EXP Floppies and new Digimon. Now that enough players have discovered Turuiemon’s Red Glove, the new “Rabbit Lord” Easter event has been unlocked for everyone to participate in. Digimon Heroes! is an action packed card battle game that features a unique match-3 battle system. Delivering fun card battles that are easy to pick up and play, the game also offers powerful card combinations and exhilarating strategic depth. Players battle to become a DIGIMON Hero saving the world from digital crisis on File Island by building the strongest DIGIMON Army through digifusing and digivolving cards, and matching Command Cards to form chains and devastate enemies. Digimon Heroes! also features an all-star cast of over 1000 of DIGIMON’s favorite and legendary characters, past and present. If you haven’t already, download Digimon Heroes on Android and iOS now!